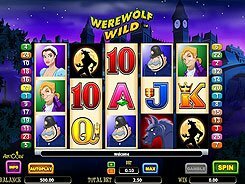 This is a 5-reel 25-payline slot with great winning opportunities through a wild, a scatter and a host of alluring bonus games. 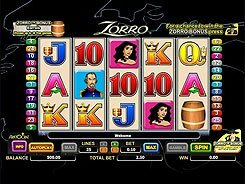 To get a chance to win the Zorro bonus, you should select the maximum lines and press a yellow button at the bottom right corner, which will result in an increase of your total bet. With Zorro Bonus activated, some regular symbols appear on the screen with letters Z, O and R superimposed over them. If the letters come to form the word ZORRO after the reels have stopped, the feature is then activated. 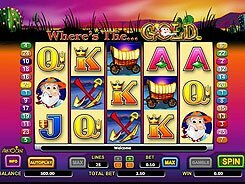 There are five types of Zorro bonuses – Tornado, Gold Coins, Wild Z, Barrels, and Magic Door – and the game software selects at random which one to trigger. E.g., in the Magic Door feature you have to pick a door to reveal a mystery character that would award up to x1000 a line bet. 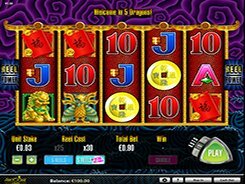 In the Barrels bonus you are invited to choose one of four barrels to determine the number of free spins (up to 20) and a multiplier attached to them (up to x15). The first and second jackpots in the game are $20,000 and $8000 respectively.